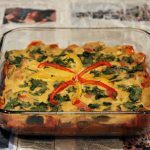 This Quiche is one of my favorite go-to breakfast/dinners when it is time to mix things up at the house! 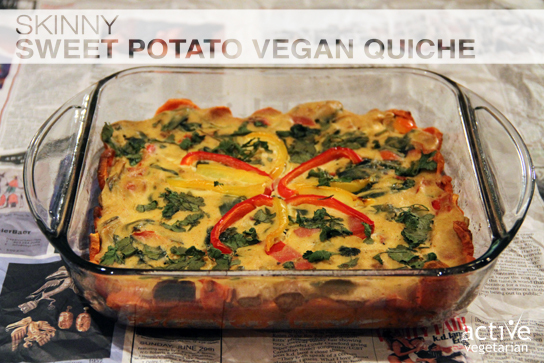 It is just over-the-top delicious, easy to make, tasty and healthy. Instead of using normal pastry for a crust, I used sweet potatoes which tastes divine, is way healthier and makes this dish gluten-free if you use tamari instead of soy sauce. Peel sweet potatoes and slice thinly with a food processor or knife. Now heat the rest of oil in a frying pan and cook the onion, white part of the scallions and the garlic until they are soft. Add in the pepper and mushrooms and saute for about 10 minutes. As they wilt, turn the heat down to its lowest setting and start with the tofu mixture. For this you will add to a food processor or blender the tofu, mustard, turmeric, soy sauce, nutritional yeast, milk, arrowroot and oil. Blend until you have a smooth consistency. Pout the tofu mixture into the greens and stir until everything is combined. Now pour this into the sweet potatoe crust and bake in the pre-heated oven for 40 -50 minutes, depending on how deep or shallow your dish is. Just check it after 35 minutes to make sure it’s not too brown. Enjoy with a salad for breakfast, lunch or dinner! If you want to eat it hot, just pop it back in the oven to re-heat.